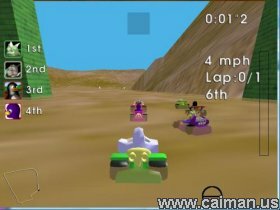 Caiman free games: Super TuxKart by SuperTuxKart Development Team. 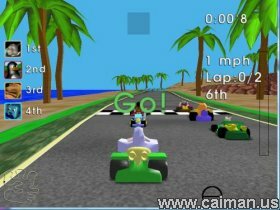 SuperTuxKart is an enhanced version of TuxKart, a kart racing game, originally done by Steve Baker, featuring Tux and a bunch of his friends. SuperTuxKart is the work of the GotM run for TuxKart at happypenguin.org. It was recently picked up by a new pair of maintainers. It is a beautiful race game with over 10 tracks to play with.There are grand prix,time trial and tux cup to choose from. Finish the race before other drivers by driving and using powerups from the blue boxes.Bananas will slow you down.Coins will let you get more powerups, but gold coins are better. At high speeds you can use wheelies to go even faster,but be careful because you will not be able to steer. If you are stuck somewhere or fail too far from the road,use the rescue button to get back on track. Author's home and downloadpage .